The Lake Charm Fruit Company Packing House, located along Geneva Road, on the south side of County Road 419 in Oviedo, Florida, in 1942. The Lake Charm Fruit Co. was established on January 22, 1923. Although the backside of the photograph states that the packing house burned down in the 1970s, it was actually destroyed in a fire in 1961. The company officially dissolved on October 21, 1974. Original black and white photograph, 1942: Oviedo Historical Society, Oviedo, Florida. Digital reproduction of Original black and white photograph, 1942. "LAKE CHARM FRUIT COMPANY." Division of Corporation, Florida Department of State. http://search.sunbiz.org/Inquiry/CorporationSearch/SearchResultDetail?inquirytype=OfficerRegisteredAgentName&directionType=Initial&searchNameOrder=WARDHAROLDJR%200118480&aggregateId=domp-011848-215349ad-8d6c-42e2-91e8-2bae5e3d115f&searchTerm=Ward%20%20%20%20%20%20%20%20%20%20%20%20%20%20%20%20Harold%20Iii%20%20%20%20A&listNameOrder=WARDHAROLDIIIA%205030802. "History of the Oviedo Fire Department Part I." City of Oviedo, Florida. http://www.cityofoviedo.net/node/1501. 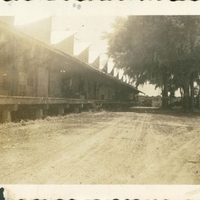 “Lake Charm Fruit Company Packing House, 1942.” RICHES of Central Florida accessed April 24, 2019, https://richesmi.cah.ucf.edu/omeka/items/show/5629.